Touched by benevolent beings of the good Outer Planes somewhere in their ancestry, aasimars are viewed with either awe or fear by all who know of their celestial heritage. Hailed as scions of angels at best or otherworldly bringers of heavenly destruction at worst, there is no doubt that aasimars hold a very special place in the world of mortals, and all know to be wary of their actions in the presence of an aasimar. 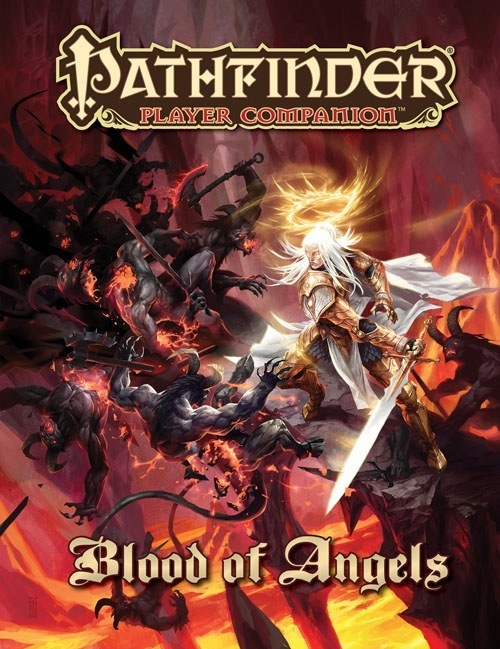 Blood of Angels presents a player-friendly overview of the aasimars of the Pathfinder campaign setting, as well as new rules and information to help players create unique and interesting celestial characters for any type of game. Expansive entries on aasimars’ origins and upbringings, their psychologies, how others perceive them, and the beliefs such angelic beings hold in the face of their celestial mark. A table of 100 variant aasimar abilities to further customize your blessed character. A detailed look at the six most common types of aasimars based on their celestial heritage, including alternate ability score modifiers, skills, and spell-like abilities for each. New curses, inquisitions, and subdomains for heavenly oracles, inquisitors, and clerics. New masterpieces for aasimar bards and the martyred bloodline for sorcerers whose celestial ancestors made great sacrifices. A host of new traits to help make your aasimar character truly unique, as well as dozens of bodily features that distinguish your celestial character. Each bimonthly 32-page Pathfinder Player Companion contains several player-focused articles exploring the volume’s theme as well as short articles with innovative new rules for social, magic, religious, and combat-focused characters, as well as traits to better anchor the player to the campaign. Note: This product is part of the Pathfinder Player Companion Subscription. Between this, the Champions of Purity, and Faiths of Purity, I am highly impressed. These three really stand out in the Player's Companion line. It's very refreshing to have Player Material focused on the Good Alignments, though, not really being exclusively a book about Good, much of the content here is more orientated towards Good than Evil. Personally, I'm not a fan of Tieflings, so I'm a bit bias towards Blood of Fiends in general, but this one, in my opinion, blows it and all of the other "Blood of" books out of the water, (up to and including Blood of Shadow currently). It's a fun read, with some solid crunch too. The alternative Heritages are a bit on the strong side, for lower level play only, but still interesting and cool. This, along with the two above mentioned books are the standard for Player's Companions that Pathfinder should aim for. And in particular, albeit far too late not, this is also the minimum standard that all the "Blood of" serious SHOULD have aimed for. Aasimars in the setting? Check. Random Aasimar Appearance Generation Table? Check. An extremely well written companion. It mirrors the Tiefling one, and that's GREAT. Wohoo. Here's to hoping that more "Blood of ..." books use this approach! A wonderfully indepth look into the lives of aasimars, "Blood of Angels" gives players a wide variety of characterful choices for those of celestial blood. Not just angels, a variety of goodly beings from the outer planes seem to have taken interest in mortals of all races. Info on non-human aasimars and lots of different varient sub-types give players tons of choices for both mechanics and fluff. Amber Scott does a fantastically good job of detailing the lives of aasimars, reminding readers that not all aasimars lead a life of purity, and giving insight into the feelings of aasimars and those of the races they associate with, casting them as a race apart and definately distinct. Regions all over Golarion are detailed with motives and likely progenitor type and there is a large section for Tian Xia. Each base class thus far published also has a write-up. For those who want mechanics, fear not. The 6 different subraces each have varient abilities and traits and there are 100 additional varient abilities to choose from. However, this is largely a fluff book! In conclusion, a great addition to any player's library. Though largely geared toward PCs, DMs may find the sections on aasimars trying to fit in a useful aid in helping PCs roleplay or use the volume to create a new NPC. A fantastic way to kick off the new monthly offering! The second book in the "Blood of" series. Blood of Angels does for Aasimars what Blood of Fiends did for Tieflings, and it does it with just as much detail and excellence. 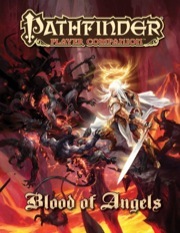 Like Fiends, Blood of Angels starts out with a sizable portion of fluff regarding all the details you could ever need to know about aasimar lifespans: Conception, birth, childhood, adolescence, physiology, society, combat, work, religion, geography, old age, friendship, love, class roles, and death are all covered in intricate detail here. In fact, the fluff section is two pages longer that that of Fiends, and like its predecessor, ends with a chart of 100 variant abilities for its respective race. Role-players and story-buffs will love this section, but others will likely flip past the first 18 pages. Next comes the aasimar heritages for the specific types of ancestors aasimars can have. There are six (compared to the 10 in Fiends for Tieflngs), each with different ability modifiers, skill modifiers, spell-like abilities, and traits. The six are: Agathion-blooded, Angel-blooded, Archon-blooded, Azata-blooded, Garuda-blooded, and Peri-blooded. Follow that up with aasimar-specific combat feats, two new oracle curses, three new inquisitions for (you-guessed it) inquisitors, three subdomains, three bard masterpieces, a new sorcerer bloodline, and a selection of aasimar race traits and random features, and you have at your disposal quite a few options for aasimar characters (and a few that will work for non-aasimars as well). When all is said and done, Blood of Angels is as worthy a book for aasimars as Blood of Fiends was for tieflings. Announced for June! Image is a mockup, and will change prior to publication. June! That's half an orbit away! Any possibility for rules regarding celestial descent for humanoids other than humans? Sweet. And nice author choice on this one. Looking forward to it! Yes! Very much looking forward to this. Really hoping they get the same range and variation that's been promised for tieflings, especially considering how weird celestials can get. Re: different celestial bloodlines: This and Blood of Fiends inclines me to believe that ifrits, oreads, suli, sylphs, and undines should have all been rolled together into a single "genie-kin" race with rules for different bloodlines, especially since the ones other than the suli are really lackluster. Mikaze will die from happiness when he... oh, he already did. Sweet son of a solar! All these cool things in the pipeline for 2012, New Year's can't come fast enough. My wallet is begging for a break. Your not the only one who's wallet wants a break. Wow we got stuff for Angels, Azatas, Agathions, Archons, Garudas, and Peris. I didn't expect them to have Garudas and Peris as well, thats cool. What about an Angel subdomain for priests of Good? No, what about a subdomain for EACH good outsider race? What about three Books of the Blessed to match the three Book of the Damned? I don't even know what garudas and peris *are* yet, and I'm exited to see bloodline options for them. All celestial and fiendish creatures being lumped under the celestial and fiendish templates (or half-celestial and half-fiendish templates), when an archon and an eladrin (azata, whatever), or a demon and devil are so different mechanically, always bugged me a little, so it's *awesome* to hear that aasimar connected to angels won't necessarily have the same base abilities or modifiers as one connected to garudas or whatever. as do the angels, archons, and azatas. It's going to be interesting to see the differences between this from Paizo and our own product. Obviously this ought to be a lot more thorough since it's only focusing on the Celestial side. That's a great find, thanks for linking to it! Also, this is awesome to hear. I'm hoping some of the information from this rubs off on the Advanced Race Guide. I recently played an angel-blooded aasimar cleric, and having more fluff is always fun. You can have a Chaotic Good cleric with the Rage subdomain, so...nyah. Hoping there's still options I can add to my aasimar post-creation for PFS. At least I can put them in for a home campaign if I carry him over. Purchasing for sure, regardless. I want evil fallen aasimar options. Righteous, primal fury born out of moral outrage in the face of evil. Someone throwing caution to the wind and letting the full wrath of Chaotic Good Elysium flow through him. Wild rager/frenzied barbarian aren't the standard for raging, and those are the only ragers that are inherently dangerous to innocents. I can't wait to see what the traits they get are like and any feats as well. I am so looking forward to this, just for the agathion options if nothing else. I am hoping for feats that improve there resistances, add more spell like abilities, and maybe add some other celestial traits/abilities. Looks like Raging Swan wanted to be Paizo to the punch! Ever since Blood of Angels was announced, the aasimar have started to grow on me. So will they have art for each aasimar variant(angel, azata, etc.)? Both Blood of Fiends AND Blood of Angels will have portraits of ALL the variants, as well as a few full-body illustrations of variants mixed in with the typical aasimars and tieflings.